Profuse gold engraving and bolino work define this magnificent piece. 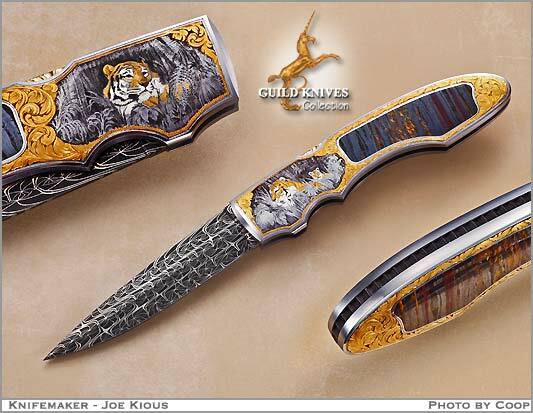 Study it carefully to see the superb engravings and subtleties of master gun and knife engraver, Lee Griffiths. Google him to see gun engravings that often run over one hundred thousand dollars. This knife is an ultra classic and one quite similar to it sold for over $20,000 a few weeks ago. The cats eye mineral used as the interframe inlay is gold and brown in color and appear like a jungle when viewed in the light. Look closely and you can see a tiger stalking through the trees. The trapdoor auto release has disappeared into the engravings on the bolster but all one need do is press down on the little baby cub tiger and whomp, the blade flies out.